Thomas: I was not expecting to enjoy this shoe as much as I have. Why? I didn’t care for the Supernova it was heavy, it didn’t breath, and the fit was off. The Energy BOOST is fun but way too heavy. The Solar BOOST isn’t super light but at 11.15 oz. / 317 grams the shoe doesn’t feel too overweight. I think the fit of the upper has something to do with the lighter perceived feel. Before we get into the upper let’s talk about the ride. The Solar BOOST is smooth through the stride and the perfect amount of bounce on take off. The refined torsion bar (Solar Propulsion Rails) does its job well keeping all that BOOST under control. 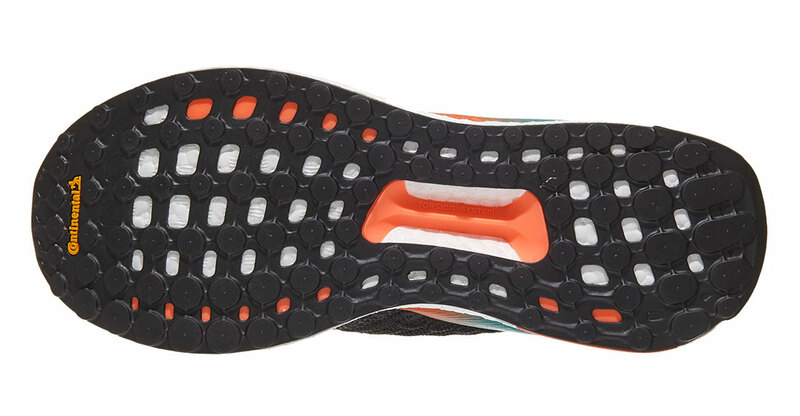 Of course, the Continental rubber outsole gives grip and keeps the BOOST in a sandwich grid. Lift out the insole and you will see what I mean. BOOST needs Spanx to keep its junk together. So under the footbed, there is a web of material that mimics the outsole. There is some additional EVA foam under the toes that helps with a firmer toe-off. Overall, these elements combined create a very buttery ride with some energy return. The upper’s fit is one of the best I have tried from adidas. The 3d woven yarn saddle made from recycled material creates a strong flexible lockdown for the laces. The tongue is thin but padded and attached to the stretchy material that wraps the toes. 3d printed lines give the vamp its shape. 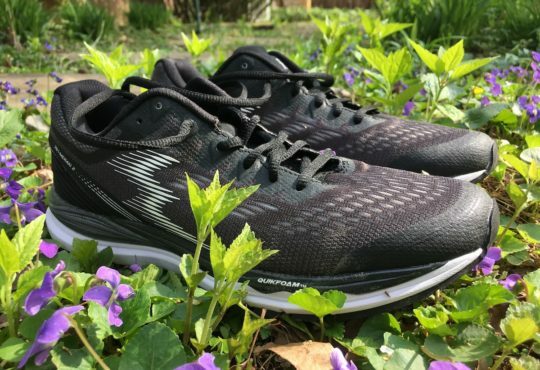 The heel counter reminded me of the Pegasus 35 in that it won’t rub your Achilles. 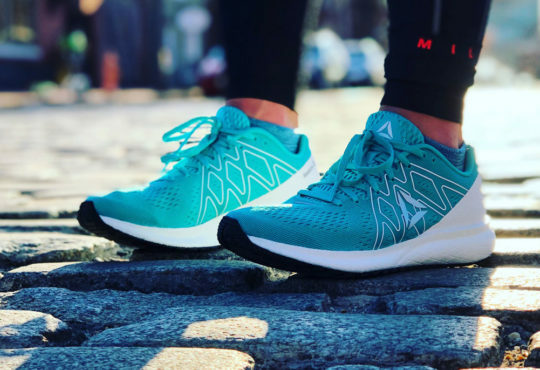 The molded plastic external heel counter has a wide opening with soft forgiving fabric that ends with a pull tab that extends away from the Achilles. Like the Peg 35, the pressure keeping your heel in is distributed to the sides not the back of the foot. The Solar BOOST runs true to size and has 10mm drop. I do like the way the shoes look. Swanky. Meaghan: First things first, this is a really pretty shoe. From the design to the colorway, I am a fan. The Solar BOOST is an everyday trainer meant to replace the Energy BOOST. It was “inspired by NASA engineering,” and I have to say the shoes are kinda space-like. The stretchy upper features adidas’ new Tailored Fiber Placement technology, essentially some stitched-in reinforcement around the midfoot made from ocean plastic. They also removed the typical rigid midfoot cage with a lightweight yarn fabric. I really like the balance of stretch and support in this shoe, it’s sock-like with a good hug around the foot. The midsole is, of course, designed with the signature BOOST material. For added stability, there’s a new lighter torsion system between the heel and forefoot. The continental rubber outsole and stretchweb provides a ton of traction and durability. These shoes are grippy. 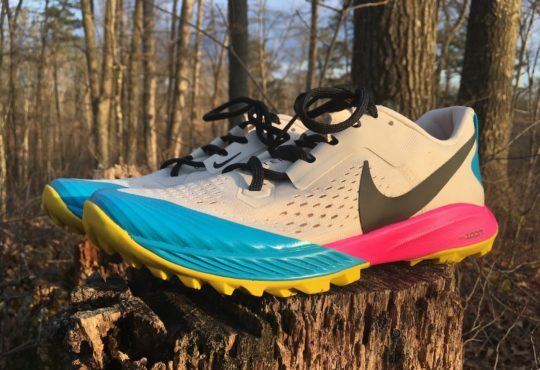 Thomas: I talked about the weight a little in the Good section, it isn’t grossly overweight, but with the React from Nike it is hard to accept that the BOOST trade-off is worth the extra ounces/grams. 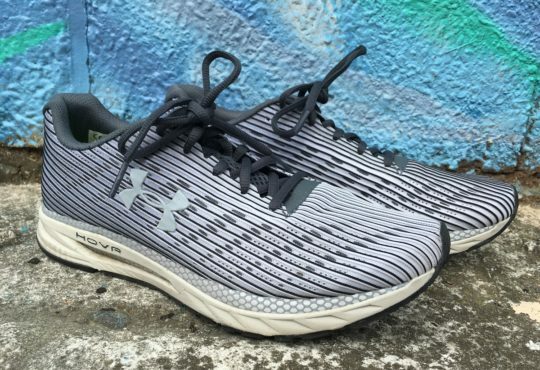 I ran in the Solar BOOST in some warm and humid conditions, my feet seemed to breath okay, but I do think breathability will be an issue runners will have with this upper. On a run with Meaghan, lack of breathability was the first thing she commented on. Meaghan: While I love the fit of the upper, it lacked in breathability. My feet warmed up real quick in these guys. I wouldn’t say it’s a deal breaker, but it’s definitely worth noting as we’re heading into Summer. Also, the shoes are a little heavy for my liking, my W7.5 weighed 9 oz. 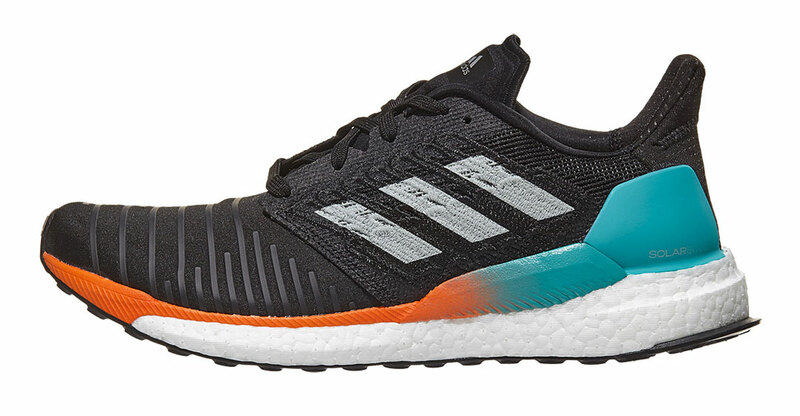 Thomas: I like the Solar BOOST, they are a pleasure to run in. 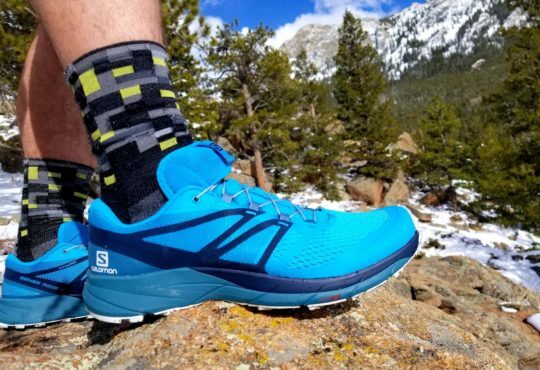 While I think they are better for daily training, I did a hill workout and striders in the Solar BOOST and they can handle both hill training and faster foot turnover. The faster I ran the better the BOOST performed. The but is, while the Solar BOOST can perform well enough, it wouldn’t be my first choice for those types of workouts. 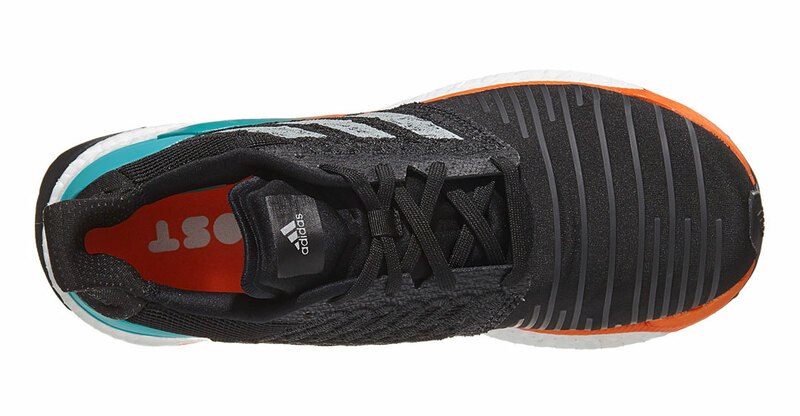 The Continental rubber outsole and the BOOST will guarantee loads of miles. These shoes will feel fresh for longer than you will want them and at $160 they had better. My guess is they are priced where they are to be $20 less expensive than the Nike Epic React. The adidas adizero adios is still my favorite BOOST trainer, but the Solar BOOST is a close second. They would make a great training combo. 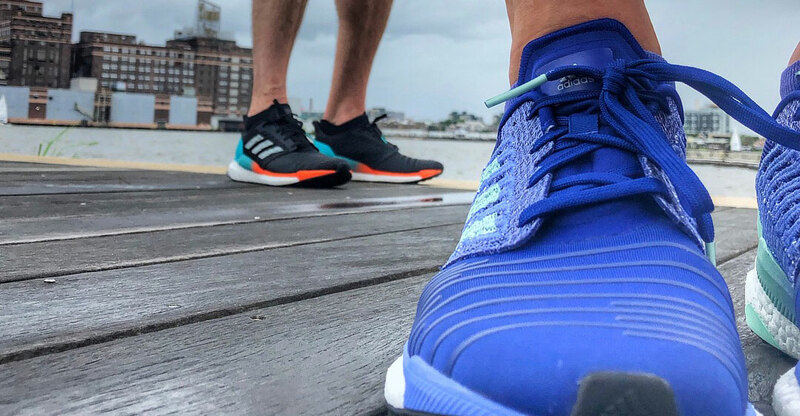 Solar Boost for your daily runs and the adios for speed days and racing. BOOM! Meaghan: I like the Solar BOOST, particularly when comparing it to previous adidas models; the brand is heading in the right direction. The shoes’ fit is near perfect and I love the aesthetics. I wish they were a smidge lighter and breathed a bit more, but outside of those personal preferences, you can’t deny it’s a quality made shoe. If you are a fan of BOOST material, I think you’re going to love this shoe. They’re worth a try, especially if you’re running in cool conditions. How does this shoe compare with the Nike epic react? 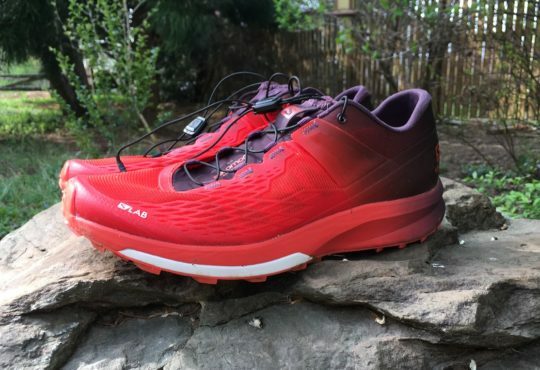 Which is a more responsive faster shoe, and which would be the most cushioned and comfortable shoe? Thanks.